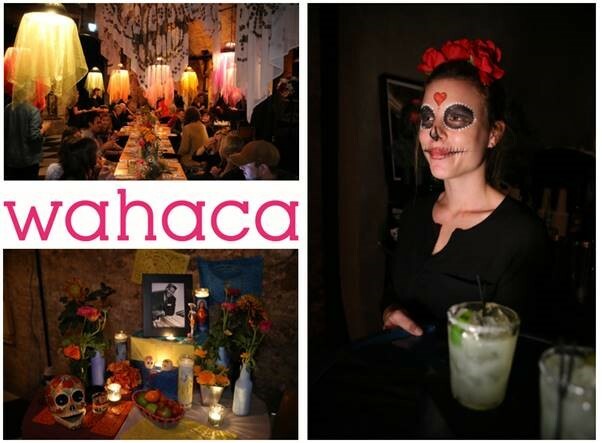 Thomasina Myers’ Mexican chain, Wahaca, have kicked off their weeklong celebration of Dia de los Muertos – the Mexican Day of the Dead. An insistent ‘celebration of life’, a slogan that adorns the walls, the custom menus, and the memory wall on which you can commemorate your loved ones, this is by no means a morbid event – and we went along to check it out. To mark this Mexican festival, Wahaca have not just hung bright banners and customised the menus; they have devised a whole feasting menu to try, and this is the true celebration of life. Vibrant, colourful, and bursting with flavour, this is a sophisticated and truly delicious way to celebrate an alternative to Halloween, to remember your loved ones, or to simply enjoy a feasting night out. The feasting menu in its entirety can be found on Wahaca’s website, but in-restaurant you are simply given a list of ambiguous dishes with little detail. The surprises you encounter ordering this way makes this an adventurous and exciting eating experience, but I am going to spoil some of those surprises and mystery ingredients in this review, so if you don’t want that spoiled I will just say: this menu is fantastic, and you will not regret ordering it. This set menu comes with a ‘welcome drink’; a Corona beer or the elusive Marigold Margarita (pictured below, right), a drink that is explained nowhere on the menu – but that’s half the fun. 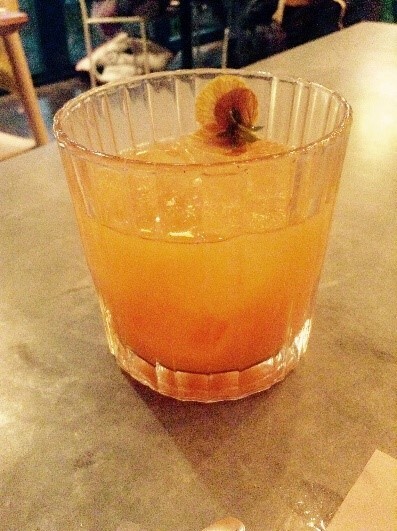 The other half is the delicious mix of tequila with carrot juice and agave that makes this a lot sweeter than your traditional margarita, while chilli liqueur and lime prevents it from being sickly, and ensures it packs a punch. Honestly, this doesn’t taste anything like carrot juice, but I will trust the waiters who explained this drink to me, and who impressively seem to know every dish inside and out. This is certainly not a welcome drink to miss out on. Alongside the deceptive appearance of carrot juice, the vegetables on this menu are truly incredible. While grilled tender-stem broccoli sounds like the least adventurous item on the menu, do not be deceived; garlic and chilli oil transform this dish so that it is far from tasting like a vegetable, let alone the watery, steamed mush that often passes as broccoli on British tables. Likewise, an arc of squash that is mild and sweet on its own is dressed to the nines with a cashew-based sauce that resembles a slightly spicy Mexican pesto, and pomegranate seeds that burst through the salt of the sauce to make it fruity and light. Wherever Wahaca source their ingredients, they are onto a winner; these flavour combinations are genius, but it really is the quality of the produce that completes these dishes. I have never raved about vegetables so much. But the star of the show is the chicken picadillo tacos, and while other dishes on this feasting menu are sticking around, these are exclusively available this week. Pulled ancho-marinated chicken in a tomato and almond sauce with green olives and ancho relish really encompasses the joy of Mexican cooking, balancing every flavour perfectly to give you a well-rounded mouthful of sweetness, salt, stickiness, and spice. It really is a shame that these aren’t on the regular main menu, so do not pass up your opportunity to try them. A world away from the rich, hot chicken tacos, the trout ceviche deserves an honourable mention for being perhaps the boldest choice for this set menu; not a texture for everyone, but the clean taste of fish, passion fruit, avocado, and sweet potato is a refreshing contrast to the richness of this menu. Not my favourite, but a worthy contribution to this meal that pushes you out of the comfort zone of tacos and margaritas. While there are some items on the set menu that I cannot comment on, I have it on good authority that the chorizo quesadilla is every bit as delicious as it sounds, and that the cornbread with chilli jam and whipped goat’s cheese is a welcome, fluffy addition to the table. It is really worth knowing that Wahaca are happy to substitute in dishes from the regular main menu in order to cater for allergies or intolerances, so that you can enjoy some of the Day of the Dead specials alongside favourites like their pork pibil tacos or sweet potato taquitos (I would highly recommend both).The waiting staff’s intimate knowledge of the menu and their attention to detail in this area is where their outstanding customer service truly shines, making this dining experience wholly enjoyable and accessible. And finally, a dessert of churros and a rich chocolate and/or caramel dipping sauce is the perfect way to end this meal; having recently become a familiar favourite across Britain, the crunchy batter rolled in cinnamon sends you home warm, full, and with your sweet tooth satisfied for at least a few days. 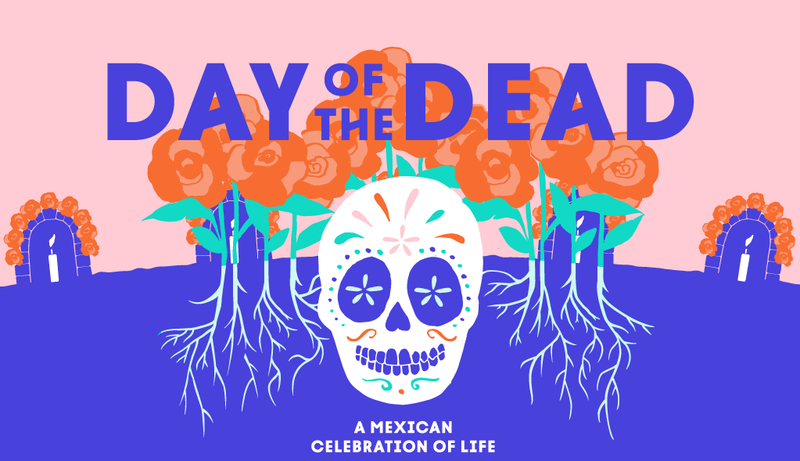 To book a Day of the Dead meal at Wahaca go to their website: https://www.wahaca.co.uk/dotd/into their restaurants without being gaudy or excessive. This is a whole new side of Mexican cuisine and the Dia de los Muertos that it is truly exciting to see pop up across the UK this week. Set menu runs until the 4th November – don’t miss out!